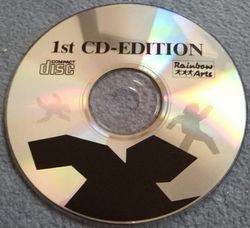 The computer games collection 1st CD-Edition by the game company Rainbow Arts with the subtitle "10 game classics on CD for the Commodore 64" was published on CD in 1989. The sales price at that time was about ?? DM. Next to the 10 games there are also actually 7 (10 are announced on the packing) computer music pieces by Chris Hülsbeck on the CD - including all six music pieces from Hollywood Poker Pro as well as the intro from Starball (each in the Amiga version) and the title tunes from To be on Top, Danger Freak and Katakis. According to the package the CD "can be run on every C64 in combination with a normal standard CD player", because reversed polarity speakers may cause trouble with the adapter. Enclosed to the CD is an adapter, that is plugged into the cassette port of the C64 and at the other end there is a line in cinch input. The chinch cable is plugged into the line out-output of the CD player. According to Lotek64 #17 it is also supposed to work with the help of a phone jack. Furthermore there is an 80-pages manual (German/English) in the package. After inserting the CD, the starting menu must first be loaded by LOAD and over the menu the corresponding game. The loading time is about 20 to 50 seconds. This page was last modified on 24 September 2017, at 17:17. This page has been accessed 4,549 times.